I am so sorry that I have to share this news via email, but we do not have a working phone number for you. Sadly, we had to help Ms. Salem pass on this week. They say cats have nine lives, but no one proved that more than our dear bobcat Salem. She left us at 24 years old, but not before living all nine lives to the fullest. To say we’re at peace with her passing may seem strange. Our hearts hurt that we’ll no longer get to see this sweet girl every day. But our hearts are full from knowing and loving her. Having our animal friends live to a ripe old age is the most we can ever ask for. Salem was a very sweet and social bobcat. One could easily mistake her for being docile because of her social nature. But Salem was completely in control. She was confident around humans and even more so around new residents she met, no matter their size. She loved to chase cats along the shared wall, or brooms when the staff were sweeping the hallways of her building. She found fun in everything! She loved to nap in boxes, roll in catnip and was always at the fence purring hello. Salem was once owned as a pet on the east coast, then transferred to a facility in Texas that closed down. TWS was her third and final home. Salem arrived in 2010 with hematoma of the ears which caused her left ear to curl and form scar tissue. The last few years, her calls for attention could be heard from the intern bunkhouse. And caretakers catered to her sweet demands. Lowering her hammocks for easy access. As her sight and hearing waned, we made sure to slightly rattle her hammock to wake her up so as not to startle her. We provided catnip and essential oil scents to keep her stimulated, and spent quality time with her. Salem had survived 2 former homes, intestinal blockage surgery due to slow motility, am putation of her front leg due to an injury, loss of sight and hearing due to age. Despite all that, she was still a happy and active girl for several years. We knew Salem was special and she made each of us feel the same way. She slowed down little by little and when her engagement with the things she loved declined, we knew she was telling us her ninth life was almost over. We honored her by helping her pass on to a place where she has limitless lives. We love and miss you! Salem, thank you for the wonderful moments and memories! 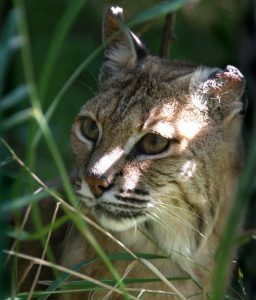 Salem, a bobcat, is in her late teens. 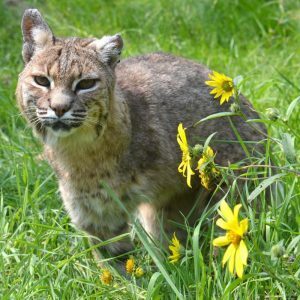 She was rescued along with two other bobcats, Harley and Lakota. We received a call that Wild Animal Orphanage (WAO) in Texas was closing down. With over 400 animals to place, we knew we had to help. These three bobcats, along with three tigers, found a forever home at The Wildcat Sanctuary in 2010. Although Salem is getting on in years, she is still very spry and light on her feet. She is usually the first one to eat and loves scents for enrichment. 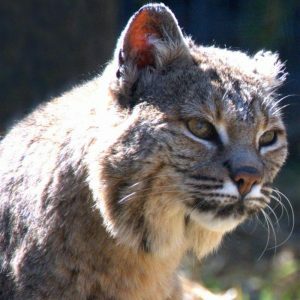 When the bobcats first arrived, they needed immediate vet care for a flea infestation and multiple types of parasites. Salem is also partially blind and deaf and has a hematoma in her left ear, but these minor health issues do not stop her from living her life to the fullest. We are so happy we were able to step up and provide Salem with the life she deserved.